The main goal of VGTU AGAI is by following the regulations of Part 145 provide qualitative, on-time maintenance of AGAI and client aircraft and their components, with the help of appropriatelly prepared employees and documents, procedures, inspections, premises, etc. 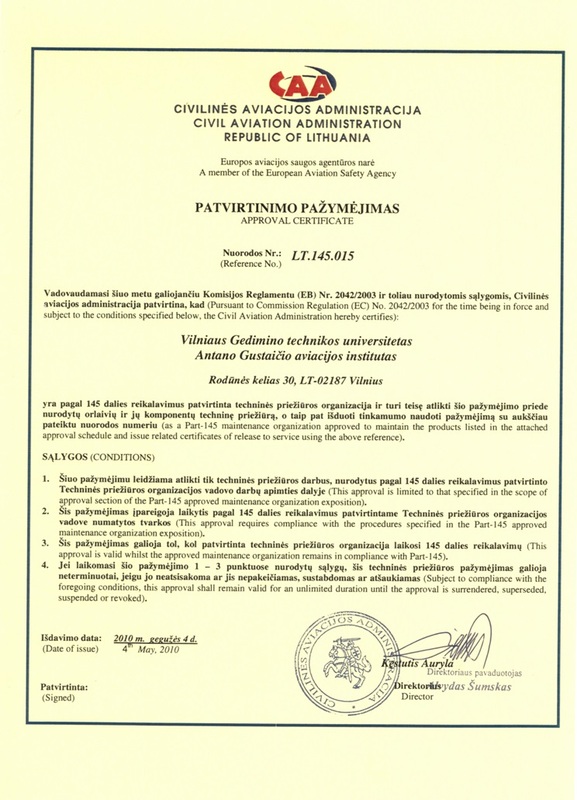 Po techninio aptarnavimo atlikimo orlaivis ir jo komponentaiAfter maintenance execution the aircraft and its components have to meet the requirements for airworthiness. This is reached by using effective quality system. Flight safety is the main goal for all activities of VGTU AGAI personnel and ensures that commercial activities do not make an impact on flight safety. VGTU AGAI applies the human factor principles, and teaches all VGTU AGAI employees the human factor and organises qualification improvement courses on this topic. All VGTU AGAI employees responsible for the quality and safety standards, andf have to follow this policy and all procedures and requirements, try to retain and improve quality standards. All employees are encouraged to report the quality manager about the faults adn incidents related to maintenance, in this case no sanctions are imposed on the employee. VGTU AGAI provides the personnel with all the required tools, equipment, specifications and time according to the procedures and provide such working conditions that teh personnel could work competently and with motivation. The quality manager is responsible for the supervision of quality, including independet audit system and meeting the requirements of Part 145. VGTU AGAI is an open and honest organisation orientated towards constant development of its technical maintenance.